I try to eat as healthy as possible during the week so I can, in the wise words of Donna and Tom, 'treat yoself' on the weekends (if you don't get that reference... I don't get you). This lasagne is one of my favourite things to make when I'm trying to eat healthier as it totally disguises all the veggies (although if you want to be even healthier try not to use as much cheese as I do!). Now as a general rule I don't really measure things out so I'm sorry there are no exact measurements but it means you can make your mince as tomato-y and garlic-y as you want and your cheese sauce as cheesy as you want. 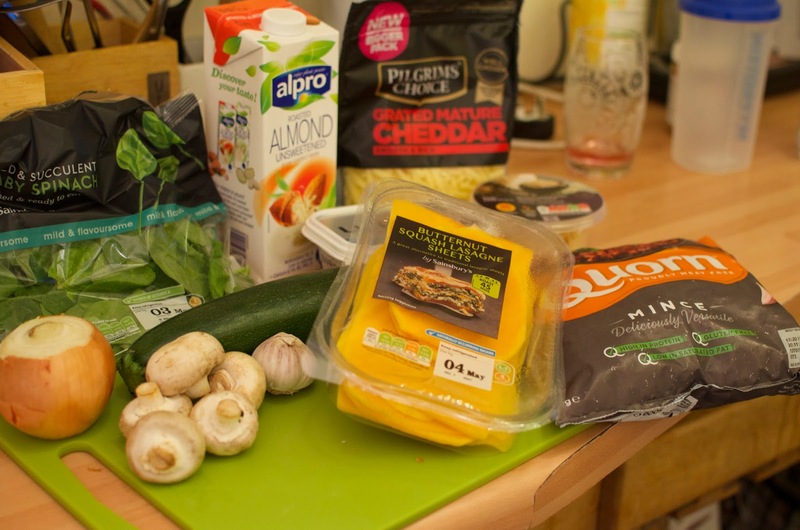 So read on to find out how I make my super cheesy all veggie lasagne! Step 1: Making the mince! Start by chopping up your onions, mushrooms and courgette into as big or small chunks as you like. The veg choices are optional, you can add whatever veg you like as this is your chance to disguise i all within the mince. Next brown off the onions, mushrooms and courgette in a big pan with one or two crushed cloves of garlic and a splash of olive oil. Now you want to add your chosen mince. As I'm doing an all veggie lasagne I'm using Quorn mince. The Quorn doesn't take too long as you're essentially just defrosting it. 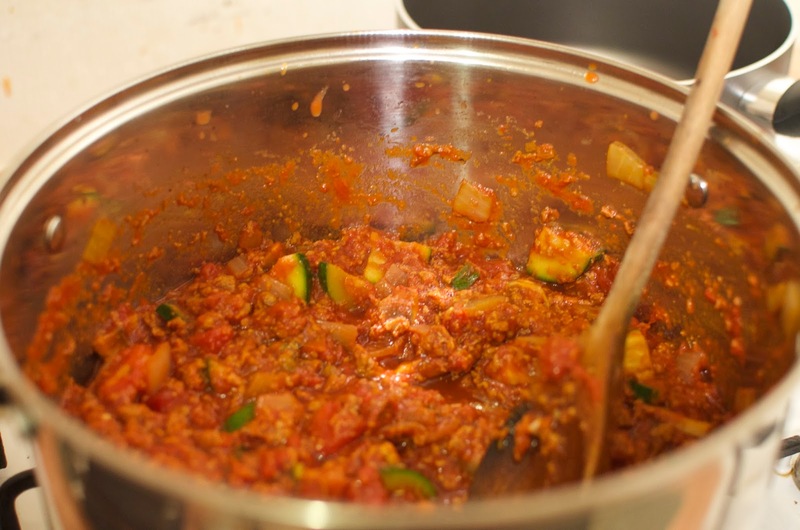 Once the Quorn is cooked I add in another clove of garlic and some of the tomato puree, just enough to cover the mince a bit - I don't know if this adds any flavour but I like to think it does! I then add in two tins of chopped tomatoes. You might need to add in a bit of water if the mince isn't saucy enough, maybe half of the one of the tins worth of water. I then add one more crushed clove of garlic, lots of mixed herbs and the rest of the tomato puree. I like to just keep tasting my mince sauce while I make it, I tend to add a bit more garlic, salt, pepper and mixed herbs as I go. Just keep tasting it until you get it to your desired taste. Once I'm happy with it I leave it to simmer on a really low heat. This is my favourite bit... making the cheese sauce! At this point I start preheating the oven to about 180-200C (depending how hot your oven is or just a guesstimate between the two if like me your oven's numbers have been rubbed off...) If you've never made a classic cheese sauce, here's a link to an actual recipe because like I said I don't really use measurements. I start by melting down a really big tablespoon of butter or two, depending how much sauce I want to make. You melt that down on a normal heat then pop it down to low. Start gradually adding plain flour to the melted butter until the butter and flour start to come together into a little almost dough like ball. That's when you start adding the milk. You don't need to use almond milk, it's just the only kind of milk I currently buy and it works perfectly fine. My diet plan is to use healthy alternatives for everything but the cheese so you can guiltlessly make it as cheesy as you want! If I'm cutting down on dairy I'd rather cut the real milk out not the cheese! Good plan right? Now it's time to assemble everything! I start with a layer of mince meat (sometimes when I want to add even more greens in I will layer spinach leaves on top of the mince at this point) and flattening it out across the bottom of my oven dish then add on a layer of cheese sauce. Don't make your layers too thick or you'll run out of the goods after just a couple layers! Then I add the butternut squash sheets where your pasta sheets would normally go. TOP TIP: Sainsbury's also sell courgette lasagne sheets but I've found these do not hold once cooked the way the butternut squash ones do! I made a lasagne with the courgette once and it just totally fell apart! In my experience, the butternut squash sheets tend to hold together similarly to pasta. This lasagne works great when it is left to cool and reheated as leftovers - it really holds its shape well then. Then repeat for as many layers as you can! If you've got a large dish you'll probably only manage three layers, you might get more out of a smaller, deeper dish. I managed three layers. I like to make sure the top layer is the thickest layer of cheese sauce! 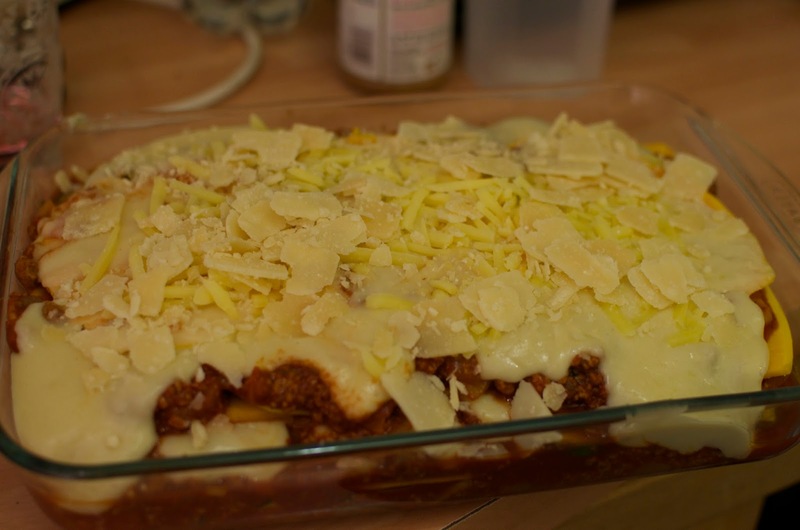 I then top the last layer of cheese sauce with extra grated cheese and some Parmesan. 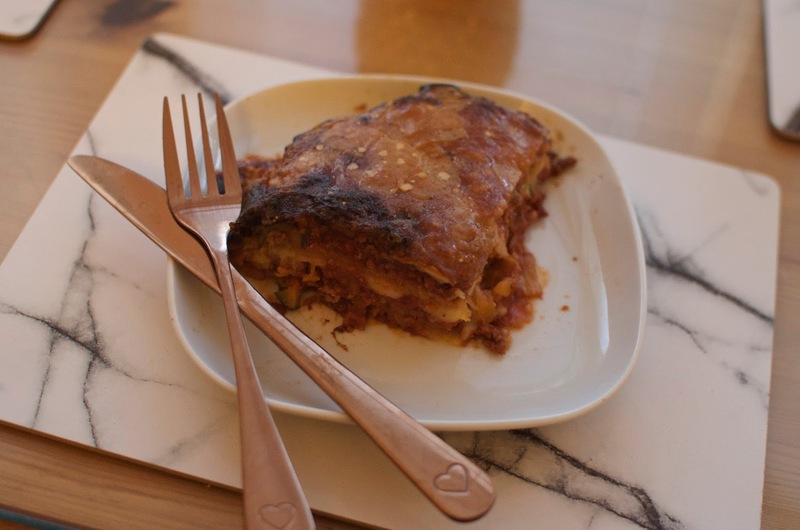 I usually use the crumbled up kind of Parmesan but they only had the flakes so this particularly lasagne turned out super cheesy (you know I ain't complaining about that!). Step 4: Pop it in the oven! Put the lasagne carefully in the oven. Now I again do not know exactly how long I cook it for, I just go back through and check on how crispy the top layer is and poke a knife through to see if the butternut squash has softened. You will definitely know when it is ready. As a guideline I would say 45-50 minutes but definitely just keep checking on it as the heat of your oven can cook things much faster or slower than others. And voila you're done! 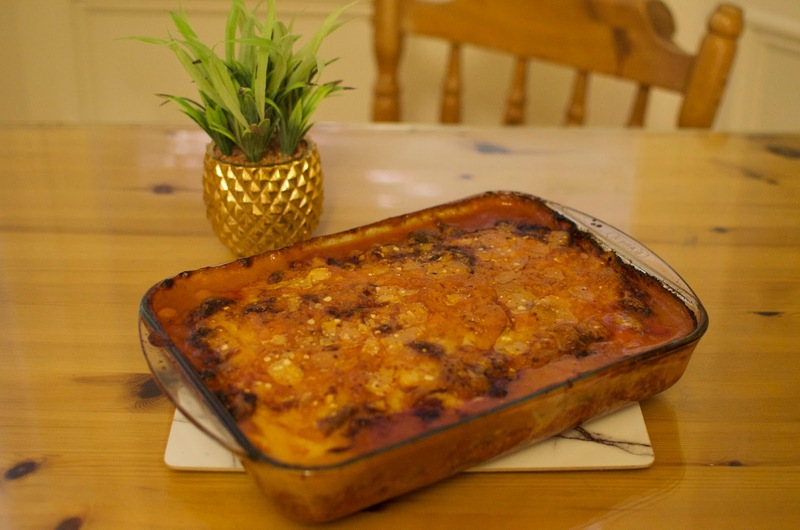 This is one of my favourite recipes as it is comfort food that doesn't make me feel as heavy as ordinary lasagne does. It's also a great way of hiding a bunch of veggies if you feel like you're not eating enough. I usually serve it with a simple salad or a whole bunch of broccoli. I love making a huge batch of it and freezing or keeping the rest in the fridge for later in the week. They reheat really well and hold their lasagne shape better after being chilled. Hope you enjoyed the 'recipe' and do let me know if you make it yourself!